My husband and I love dogs. Cancel that. We adore dogs. In our time together, we have rescued dogs with vision problems and had also loved dogs who have lost their vision. Perhaps this was one of the reasons I was so enchanted with Steve and Julie, married on Friday evening at DeLille Cellars. This compassionate and gracious couple rescued their sweet dog, Kodi, a few years ago. 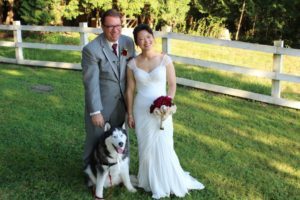 Kodi, who is now blind, was presented mid-ceremony as a ‘surprise ring bearer’ – a sweet surprise from Steve to his beautiful bride. 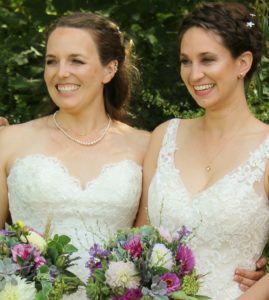 Two beautiful ladies, Kimball and Nicole, were sweetly married at The Pickering Barn on Sunday afternoon, surrounded by a great group of very joyful family and friends. These two women worked with me to create a beautiful ceremony that not only celebrated the two of them but their family and friends as well. We wrote in a sweet remembrance for Kimball’s brother who is no longer with us as well as other pieces that reflect the anticipation these two gracious women have for their future. I love a wedding ceremony on Bainbridge Island. Newcomers to the area, Mark and Joanna, chose the Hilltop park area for their ceremony and a lovely restaurant in Winslow for their reception. 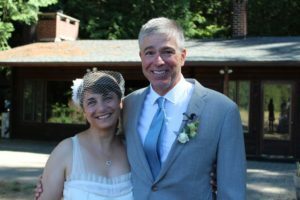 This dynamic duo love adventure and while they are on their honeymoon to Alaska, I’m delighted to share this sweet picture taken just after ceremony.